Blue light from any device can interrupt your circadian rhythm, which research suggests can lead to all sorts of tiredness related problems. One of the best ways to get around that is to use a blue light filter to change the color palette of your display. Some of the best monitors have their own blue light filters built into them, but there are plenty of software solutions, too. Windows 10 and MacOS have their own blue light filters and there are a number of third-party apps that you can use as well. If you’re looking for a blue light filter for your smartphone, there are great screen filter options, as well as apps you can download from the Google Play or iOS App stores. What’s the problem with blue light? The reason blue light hurts is purely biological. Sleep is a part of the circadian rhythm, the cycle of biological processes that is determined in part by the amount of light and dark to which our bodies are exposed. In the most natural setting, which is one where we’re only exposed to sunlight, our retinas sense when the sun is going down and the environment is getting darker. That induces our hypothalamus to tell the body to produce melatonin and other sleep hormones and to reduce our body temperature. When we use artificial lighting to extend our day, however, our bodies get confused and the various sleep signals are disrupted. Even worse is the blue light that’s emitted by fluorescent and LED lights — like those on our various device displays — and that actually causes us to be more alert and to produce even less melatonin. That’s why using a filter is so important. Microsoft added a blue light limiting feature to Windows 10 in the Creators Update that was released in April 2017. 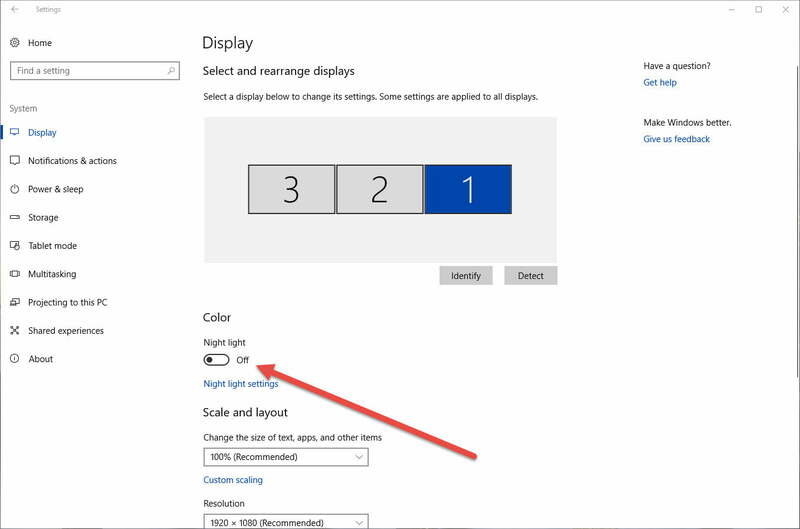 Called “Night light,” this feature shifts the Windows 10 display to show warmer colors that reduce the amount of blue light that’s emitted. Turning the Night light feature on is a simple enough process. Step 1: Open up the settings menu by searching for it in the Windows 10 search box, or press the Windows key and X and then click Settings. Step 2: Choose System from the menu. Step 3: Select Display from the left-hand menu if it isn’t already. Step 4: Toggle the Night light switch to on. 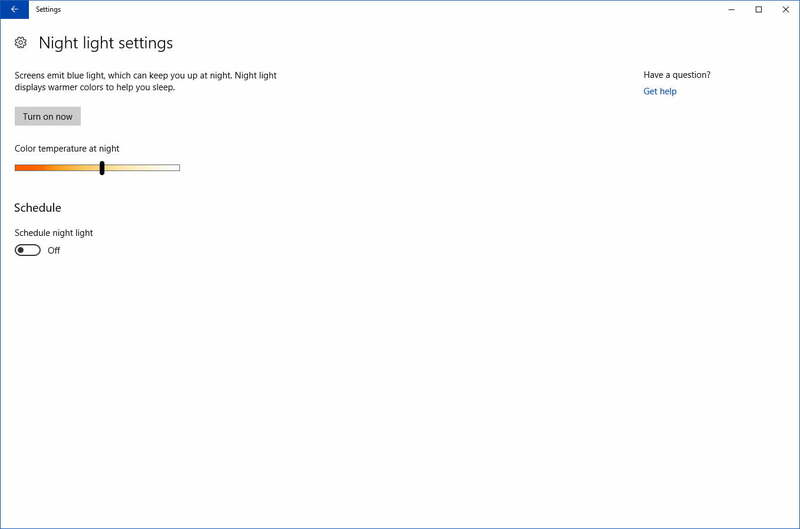 To configure the Night light feature, click on Night light settings. Configuration options include the ability to turn the Night light on immediately, adjust the color temperature while the feature is enabled, and schedule when the Night light will turn on and off. To set the schedule, toggle the Schedule night light option to on. Then, you can either choose to let Night light turn itself on at sunset and off at sunrise — automatically determined by your location — or you can set the time manually by clicking Set hours and choosing when the feature should turn on and off. When you first turn the feature on, you’ll notice the color shift immediately. After a while, your eyes will adjust to the change and it should be less intrusive. By reducing the amount of blue light, however, the Night light feature will then be limiting the impact of using your Windows 10 PC late at night — you could find it easier to get to sleep, and your sleep might be deeper and more restful. First introduced in iOS, Apple brought Night Shift to MacOS in MacOS Sierra in March 2017. As with Windows 10, the feature is easy enough to turn on and configure to your tastes. 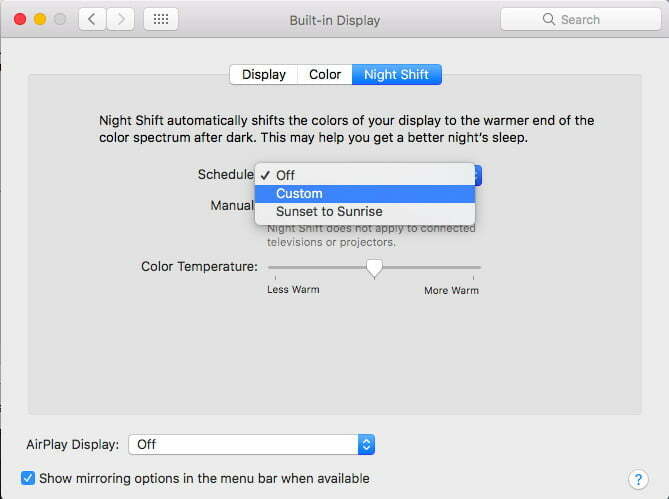 Step 2: Select Displays, then click on the Night Shift tab. 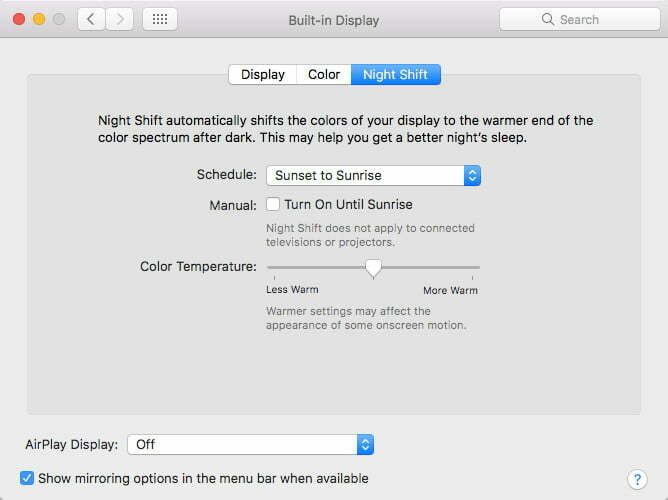 On the settings page, you can configure when the Night Shift feature will automatically run, turn it on until the next day’s sunrise, and set the color temperature to your preferences. In terms of scheduling, you can let MacOS turn it on and off at sunset and sunrise based on your location, or you can set a custom schedule. Just like with Windows 10’s Night light feature, Night Shift will make your display’s colors warmer and reduce the amount of blue light that’s emitted. Give it a try to see if it improves your sleep habits and lets you be healthier, more productive, and generally a happier Mac user. F.lux — Free for Windows, MacOS, and Linux platforms, f.lux is a filtering tool that tracks the sun in your local area to make sure that the color temperature of your monitor(s) matches the local light level. It features the option to turn it off for fullscreen apps (so games and photo-editing aren’t overly affected) and it can even integrate with smart lighting systems if you want to automatically tweak your room lighting at the same time. Iris mini — A truly lightweight blue-light filter application, Iris mini has no UI, no buttons, and no “confusing options,” just the ability to adjust your monitors’ coloring to best protect your eyes from glare and harmful blue light. You can manually control it if you wish, but automatic mode will keep up with where the sun is in relation to your location and automatically adjust your screen’s coloring accordingly.